A hero is only as strong as their villain. With that said, Batman has to be the strongest hero because his rogues gallery is the best in comics. While many of The Dark Knight’s best villains have been in multiple movies (Two-Face, The Joker, The Riddler, Bane and Ra’s Al Ghul), there are many underused villains just waiting for their time to shine. With a Ben Affleck-Batman standalone film on the way, here are our suggestions for the 7 Batman Villains That Need To Be In A Solo Movie! Tommy Elliott and Bruce Wayne were childhood besties before a tragedy turned them into bitter rivals. Elliott would return years later as Hush, a supervillain that conspired with The Joker, Clayface and many more villains to try and kill the Bat. Elliott’s fanatical obsession with destroying Bruce Wayne’s entire life makes him worthy of his own movie. Hush would be a wonderful opportunity to get some insight on The Wayne family past and Batman’s conflict with his former BFF! Part of what makes Batman so dangerous is that he knows his opponents better than they do. When the mysterious Court of Owls sent their assassins to kill Bruce Wayne, Batman realized that there are still parts of Gotham even he doesn’t know about. The Court of Owls and their Talon assassins deserve their own movie as they represent century-long-corruption in the cities elite and only Batman could get to the root of the problem. Gotham has shown that The Court of Owls would be an interesting way to highlight the storied history of Gotham City! Kirk Langstrom was a Wayne Tech scientist creating a cure for deafness using bat DNA so the deaf could use sonar-like senses. The cure works, but transforms Langstrom into a giant Man-Bat who acts only on instinct. Man-Bat’s primal strength and Jekyll and Hyde personality are plenty interesting for a movie. One film idea would be to flashback to Batman’s first year with wearing the cowl when a mysterious Bat-figure starts wreaking havoc around Gotham. The police and public declare Batman public enemy number one as The Dark Knight races to find the impostor. Plus a chase sequence across Gotham’s night sky would be incredible visuals for a Batman movie! Even though Gotham just included The Red Hood Gang onto their show, we’re still dying to see this rosy group on the big screen. The Red Hood Gang formed after the death of beloved Martha and Thomas Wayne, recognizing the fear that swept over the city. The Gang believes one person can terrorize a city through crime and murder in an inversion of Batman’s own symbol of hope. The Red Hood Gang even has direct ties to the Joker’s origin, which could show the creation of the most iconic supervillain of all time on the big screen! Gotham City and Batman seem to attract the worst type of deranged criminals. Among them all, Victor Zsasz is truly an elite level psycho. 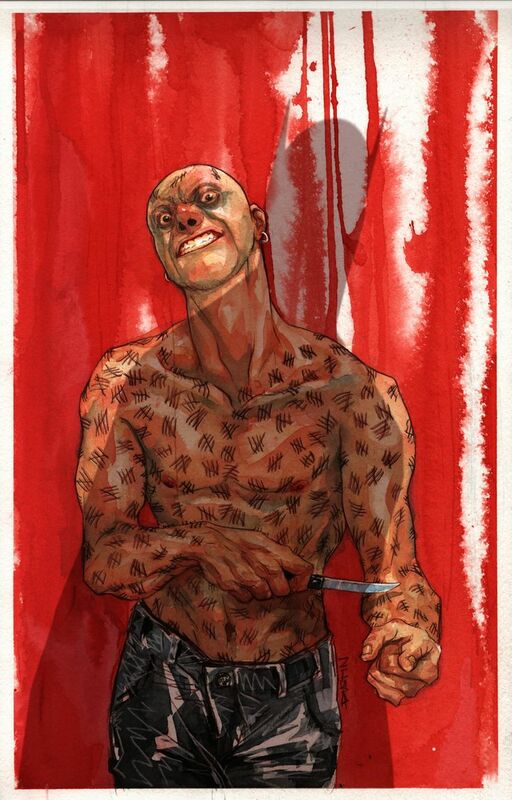 Mr. Zsasz takes enjoyment out of killing and carves a hashmark into his body for each victim. While not “featured villain” material, Zsasz is worthy of a small part in a future movie to truly test Batman’s limits with insane killers. Calendar Man may sound like a villain for Procrastination Man, not the infamous Dark Knight. Calendar Man is one of the main villains in The Long Halloween, one of the greatest Batman stories ever and features the Caped Crusader racing to solve a series of Holiday-themed murders. With a genius level intellect on par with any DC character, Calendar Man is on a very short list of people that can outsmart Batman. Bringing Calendar Man and The Long Halloween to the big screen would be an incredible way to challenge the World’s Greatest Detective! The ultimate mercenary, Deathstroke is the only guy on this list that can physically match the Dark Knight in combat. A for-hire assassin that prides himself on being one of the best martial artists, weapons expert and strategists on the planet, Deathstroke is the guy to call when you need a job done. Once Deathstroke takes a contract on your head, nothing will stand in his way until his mission is accomplished. A film idea would be to have The Penguin post a $1 billion hit on Batman that brings every assassin in the DC Universe knocking on Gotham’s door! Which Batman villain are you dying to see in a movie?